The summer sun can be one of our best friends, providing us with warmth, beautiful weather and even happiness. However, overexposure to the sun’s rays can also be harmful to our bodies. Here are five things to consider to help you better understand SPF, choose the best sunscreen, and protect your skin. Never miss another Cancer Talk blog! Sign up to receive our monthly Cancer Talk e-newsletter. 1. What does SPF mean? SPF is an acronym for Sun Protection Factor. Sunscreen products are based on an SPF number, which helps you know how much protection each specific product will provide. Dermatologists suggest using a SPF of at least 30, which blocks 97 percent of the sun’s rays. No sunscreen protects against 100 percent of the sun’s rays. All sunscreen should be reapplied every two hours and complete skin coverage is recommended. 3. Does skin type matter? Everyone should apply sunscreen whether you have a light or dark complexion. Skin cancer affects people of all color and race, but those with lighter skin do have a higher risk of skin cancer. 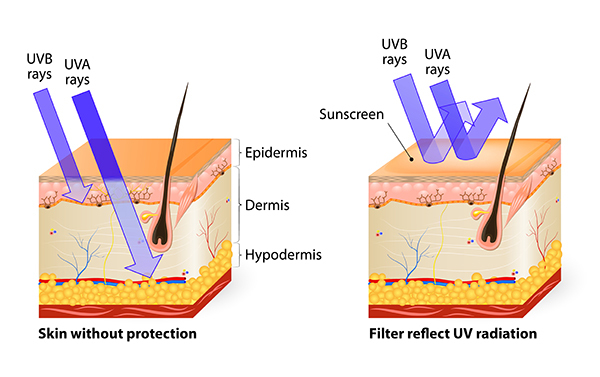 It is important to remember that “broad spectrum” coverage is always recommended for all skin types for protection from both UVA and UVB rays. For a better understanding of how to read the sunscreen labels the American Academy of Dermatology (AAD) has an easy-to-follow guide. One of the most important things to remember is that any sunscreen, regardless of its SPF, will not work if it's not applied correctly. Sunscreen takes about 15 minutes to absorb into the skin. So try to apply your SPF protection prior to going out in the sun. A proper amount of sunscreen to cover the whole body is about the size of a shot glass or 1 oz. It is also recommended to reapply sunscreen every two hours of continuous sun exposure and after swimming or sweating. Can People of Color Get Skin Cancer? Make an appointment by calling 1-800-ROSWELL (1-800-767-9355).